ALS Speak It is a communication assistance application designed specifically to assist people living with ALS. Developed by Dave Krier, an active volunteer and former board member of the The ALS Association, Iowa Chapter. Dave originally designed the application for his Mother, who was diagnosed with ALS in 1998. Dave donated this application to The ALS Association, Iowa Chapter so that others could use it. 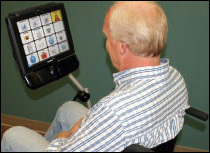 The ALS Association provides this application free of charge as part of their commitment to provide patient services to those living with ALS. For more information please contact Care Services at 515.727.1678.